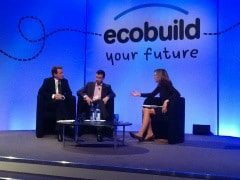 In a keynote speech on the opening day of Ecobuild, Minister of State Greg Barker re-committed the coalition to delivering the “Flagship” Green Deal programme in the Autumn. Smaller installers are no longer required to submit a Surety Bond prior to Green Deal Accreditation, and Installers will non longer have to make arrangements for independent arbitration for disputes with customers, as Barker announced a Green Deal Ombudsman. The detail is still being finalised, but Barker pointed to exciting technologies in heating, glazing, lighting, and smart controls, and mentioned technologies such as flue gas recovery and waste water recovery as up for consideration in the future. A stronger link between Green Deal and the Renewable Heat Incentive will be encouraged so consumers will see investment in a single proposition.